When you spend years creating gourmet dishes that can be easily eaten in the dark, you learn a thing or two about what makes a good handheld meal. Enter Justin Sherrer, Doce Provisions’ chef and co-owner, who spent nearly a decade as executive chef of Cinebistros across the country. 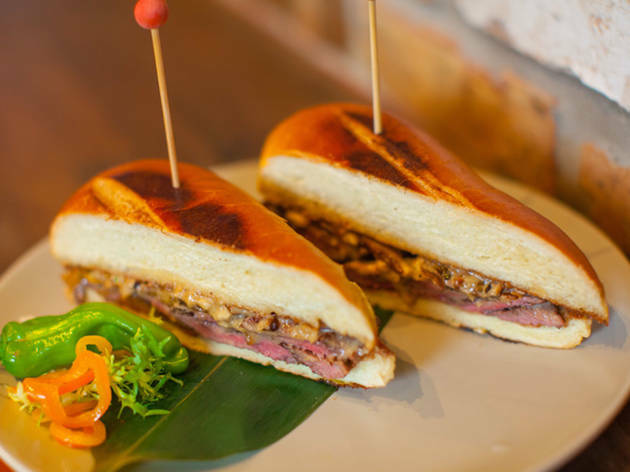 These days you’ll find him and girlfriend/co-owner Lisetty Llampalla at their Little Havana restaurant, slinging Latin-style sandwiches inspired by current culinary trends—locally sourced ingredients, Asian preparations, gastropub-influenced. The sandwich portion of the menu, dubbed “Pan y Tostada,” which is Spanish for bread and toasts, features some names you might recognize but made with ingredients you wouldn’t necessarily expect. 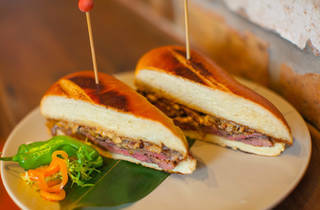 There’s a Cubano stuffed with Italian soppressata in addition to traditional pork loin and a steak sandwich (pan con bistec) smothered in truffle cheese and shallot marmalade. Great tasting food. Tiny dining area, but cute. Incredibly LOUD. Between the kitchen noise and music, it was hard to carry on any kind of conversation.